Rotarian Warren Irving and Derek Chisholm Shelter Box facilitator. Front: Emily Georgetti and Keegan Ryan from Manakau, Stormy Hanson and Bailey Cowan Otaki School, Shea Lenaghan and Tiaria McGhie from Te Horo and Waitohu’s Kyren Paitiawa and Skye Heenan. With the recent natural disasters in Vanuatu and Nepal, many of Otaki’s school children know they have contributed to aid through the Otaki Rotary Club’s Shelter Box project. Over recent months, Rotary members have visited the schools in Manakau, Waitohu, Otaki and Te Horo to talk to the pupils about the Shelter Boxes and display a box and its contents. 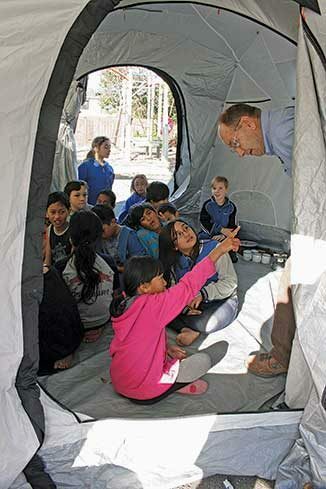 At the beginning of the programme, the schools had been encouraged to fundraise for the project where they could go through the tent, from the box, and see the equipment each held. Their last visit was to Otaki School on May 19. Each school was invited to take two representatives to Otaki School where they received a certificate from the Rotary Club thanking them for their involvement and contributions. The kids were asked their opinion of the project and what they thought of it. 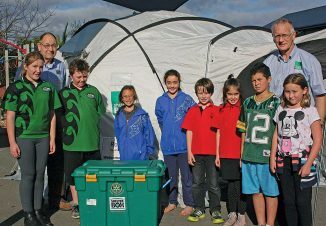 Manakau School’s Keegan Ryan and Emily Georgetti, both 12, had positive ideas of what the Shelter Boxes were providing. Each Shelter Box contains a tent, four ground sheets and four mosquito nets and 10 thermal fleece blankets, fuel stove and spare fuel, cooking utensils, plates and mugs, water containers and water purifying tablets, basic first aid kit, basic tool box, shovel, a school bag with pencils and reading and colouring books and coloured pencils so children can get back to school. Boxes have gone to 85 different countries. Each school held their own fundraiser, mostly gold coin trails, some with a twist. Otaki School managed to spell out Nepal with the coins received, Waitohu had a coin trail and are organising a film screening after school one day and Te Horo pupils sold apples and loom bands for their effort. The schools raised $1300-1400. Each Shelter Box costs $1500 to complete and transport almost anywhere in the world where emergency help is needed. Rotary matched all donations dollar for dollar, two boxes were purchased by Otaki Rotarians, one from the schools and one from Rotary. “The big interest will be when the kids go online and see where their boxes have gone to!” Otaki School principal Chris Derbidge said. Shelter Box is an international Rotary project which supplies shelter and lifesaving equipment to families who have lost their homes through natural or man-made disasters such as floods, earthquake hurricanes, volcanoes tsunami or armed conflict. Following a disaster Rotary representatives go to the area and assess the needs before sending the boxes. Most of the boxes sent to Vanuatu held tarpaulins and building equipment to assist with relief work there. This is an ongoing project for all Rotary clubs.